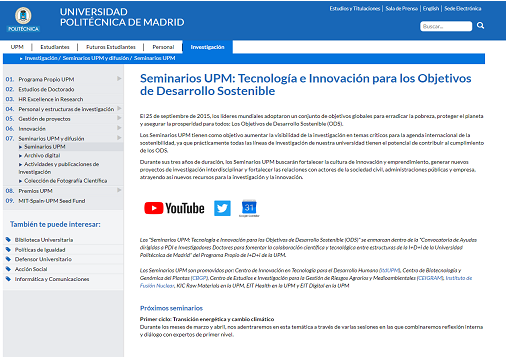 The Vice-rectorate for Research, Innovation and Doctoral Studies of the Technical University of Madrid (UPM) (Spain) regularly organizes Workshops on Technology and Innovation for Sustainable Development Goals (SNGs), specifically addressed to the research community. The aim of the workshops is to increase the visibility of research on critical subjects concerning the International Agenda for Sustainable Development, as well as to strengthen the culture of innovation and entrepreneurship and foster interdisciplinary relationships. Within the workshop on ‘Energy Transition and Climate Change’, UPM organized a session titled ‘Marketplace of Initiatives’ on 5 March 2019, with a view to SDGs and impact on energy transition and climate change. The objective of this session was to disseminate UPM initiatives on ‘Energy Transition and Climate Change’ with a focus on SDGs, in order to foster synergies and generate partnerships among research teams so that their impact on society is increased. 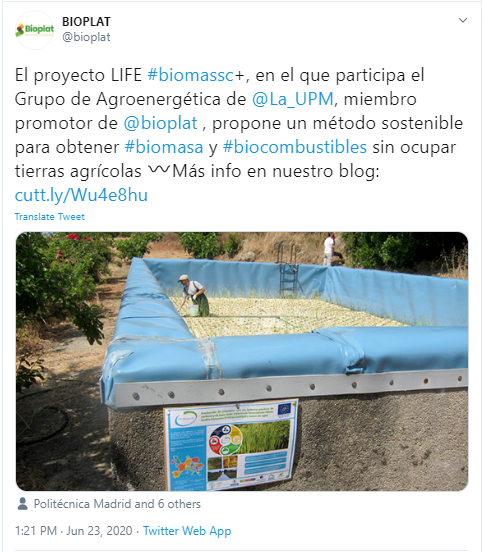 The project Life Biomass C+ is a good example of initiative in line with ‘Energy Transition and Climate Change’. It was framed within the sub-programme ‘Climate Action’, ‘Climate Change Mitigation project application’; it counts among its partners with the Agro-Energy Group of the UPM. In view of the foregoing, Life Biomass C+ was invited to contribute to the session ‘Marketplace of Initiatives’ in the Workshop on ‘Energy Transition and Climate Change’. The presentation was made by Prof. María Dolores Curt (Agro-Energy Group of UPM); indications given in the organizers’ presentation layout were observed. Among other aspects, Prof. Curt highlighted that Life Biomass C+ fits to SDG 6-Clean Water, SDG 7-Affordable and Clean Energy, and SDG13- Climate Action, and the fact that it is an international project that pays special attention to the issues of LUC and water contamination.